The Haut-Richelieu includes 14 municipalities, representing 114,137 residents (official gazette of 29 December 2010). 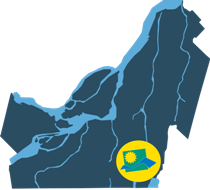 Located in southern Quebec, near Montreal markets and the U.S. border, it has about 300 companies covering 19 industrial sectors. Industrial parks, located at strategic locations and equipped with modern facilities, meet the needs of investors. The MRC, supported by the Economic Council of Haut-Richelieu (CLD), the Chamber of Commerce du Haut-Richelieu (CCHR) and various key agencies, maintains the region's economy prosperous and competitive. Diversity and quality are our CRM a fertile environment for investment. Feel free to access the website of the Economic Council of Haut-Richelieu (CLD)for more information.